The Dhawan family is enjoying their happy time ever since director Rohit Dhawan and his wife Jaanvi Desai welcomed their first child in May this year. The family has been enjoying each day with their baby girl. As it has been almost two months since the baby was born, it was only time her first glimpse was shared with the fans. 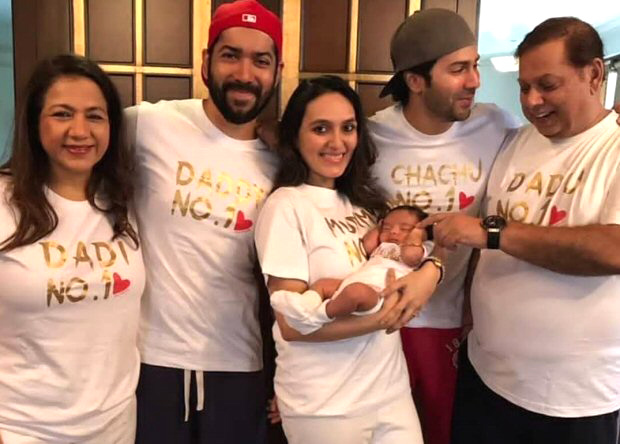 Varun Dhawan, who is super excited since his niece’s arrival, shared a family portrait featuring the little one, parents Rohit Dhawan, Jaanvi Desai and grandparents David Dhawan and Laali Dhawan. ‘Chachu’ Varun Dhawan, recently during a conversation with fans on Twitter, had promised that he will soon share pictures of his niece. Keeping his promise, on Wednesday morning, Varun shared a family portrait with the little one sleeping in her mom‘s arms as they smiled and posed for pictures. He simply wrote, “love at first sight.” Every family member was wearing customized T-shirts which is in reference to David’s hit film Hero No 1. Jaanvi and Rohit wore Mommy and Daddy No 1 tees wheres grandparents David and Laali wore Dadu and Daadi No 1 tees. Varun, who is seen smiling in the pictures, is seen in Chachu No 1 tee. This is family portrait is absolutely adorable. Rohit Dhawan has directed films like the Akshay Kumar – John Abraham starrer Desi Boyz (2011) and the Varun Dhawan – John Abraham starrer Dishoom (2016). Dishoomwas the first collaboration between the brothers as an actor-director duo. Meanwhile, Varun Dhawan will be next seen in YRF’s Sui Dhaaga– Made in India. The film stars Anushka Sharma in the lead. Directed by Sharat Katariya, it slated to release on September 28, 2018. He is currently shooting for Abhishek Varman’s Kalank which stars Alia Bhatt, Aditya Roy Kapur, Sanjay Dutt, Madhuri Dixit and Sonakshi Sinha.